Fans who were at the 1991 Drum Corps International World Championships at the famed Cotton Bowl in Dallas likely remember Finals for a few reasons, most of them good. But the heat and humidity the final night of the season took quite a toll on the audience, a precursor of the oppressive weather to come in Jackson two years later and Foxboro in 2005. Despite the heat, no one in Dallas will ever forget witnessing George Zingali's end-of-season dissolving and re-appearing cross finale to the winning Star of Indiana show, which unfortunately turned out to be his final masterpiece. Perhaps the most memorable musical moment of the event was Santa Clara Vanguard's remarkable acoustic helicopter effect that opened and closed the corps' "Miss Saigon" show, launching to arranging stardom a relatively unknown young writer by the name of Scott Johnson, now head of Blue Devils' drum line and elected to the DCI Hall of Fame in 2012. And finishing 0.70 out of first place in what would have been the corps' first DCI World Championship, were the Cavaliers. Their "Cavalier Anthems: The Advent Collection" began with Fisher Tull's "Variants on an Advent Hymn," a short intro based on the melody best known as "O Come, O Come Emmanuel." This led into Ron Nelson's "Te Deum Laudamus," a work originally written for chorus and wind ensemble. Exuding a dynamic bravado, the piece fit well into the genre of contemporary symphonic sophistication that the corps had been exploring and nurturing for the past few seasons. A most unique sight was the use of windsocks with long streamers by the color guard during Samuel Barber's "Die Natali," based on "Silent Night." These metallic silver and blue creations were inverted midway for a totally different color scheme, an effect as mesmerizing as it was simple in concept, perhaps the single most charming and enchanting visual effect of the year. Benjamin Britten's "Men of Goodwill," based on "God Rest Ye Merry, Gentlemen," featured the corps' geometric drill evolutions and a series of pounding bass drums that turned the gentle melody into the most barbaric musical feature of the season, reminiscent of the corps' brutal "Images Diabolique" of 1989. Originally written for the 1947 BBC Radio prelude to King George VI's 1947 Christmas Day speech, the work wasn't published until nine years prior to the Cavaliers' performance. 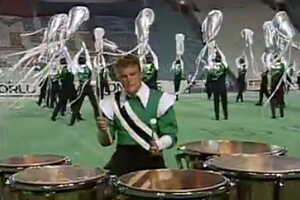 Performance excerpt of the 1991 Cavaliers. Discount DVD offer ends Monday, June 4 at 8:30 a.m. ET.